If you aren’t getting the closest shave possible, you might as well just let your beard grow. 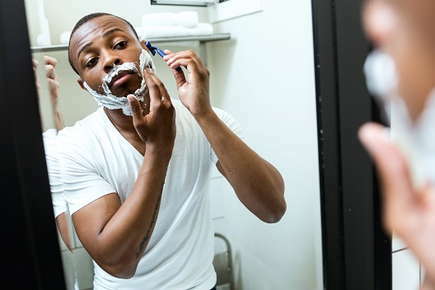 But if you want skin that is soft and smooth — and free of nicks and razor burn — here are some tips to help you achieve the best shave of your life. Wet your beard thoroughly. Wet hair is much easier for your razor blade to cut, which means you will have less irritation and razor burn. Showering before shaving is the best way to moisten your beard. It will open your pores and soften your whiskers. If you don’t have time for that, apply a warm, wet cloth to your face for two or more minutes. A preshave oil can be used if you have more than a day-old beard. Use a high-quality shaving cream. Good shaving creams have both lubricants and moisturizers. They should create a creamy lather — not a light foam — so it sticks to your skin and beard. This will decrease the resistance between your blade and face, and give you less irritation and fewer nicks. Your blade will also last longer. Try applying shaving cream with a shaving brush to create a thick lather and lift up the hair. If possible, leave the shaving cream on your face for at least a minute before you start shaving. Use a top-notch razor and fresh blades. Your shave is only as good as your razor. For disposables and cartridge razors, look for multi-blade models. To reduce irritation, try one with lubricant strips. Use only sharp blades. A dull blade is more likely to lead to razor burn or rash. How often you have to change your blade depends upon how tough your beard is. If you shave daily, you should change your blade every three to ten shaves. Any time your blade feels dull, though, swap it for a new one. Shave the right way. Shave “with the grain” of your beard, which means in the direction that your hair grows. For a closer shave, you can re-lather and then shave across the grain on the second pass. Start shaving on your cheeks and then tackle the upper lip and chin. This will give the tougher chin hairs more time to soften. Pull your skin taut with your free hand to expose more of the hair. Don’t press too hard with the blade. This can cause razor burn or bumps — ingrown hairs. Run the blade under hot water after every few swipes to rinse off the hair and shaving cream. Cool and soothe after your shave. After shaving, use warm water to rinse your face. You can also try a facial wash with witch hazel to soothe your skin and tea tree oil to protect you from shaving rash. For nicks, use a medicated stone that contains potassium and alum. After washing your face, rinse with cool water and pat dry. Apply an aftershave lotion to soothe and moisturize your skin. Look for one that is non-greasy and absorbs quickly. Shaving around a beard or mustache. To make it easier to shave near your beard or mustache, trim them regularly. Then shave your face away from your beard so you don’t accidentally shave off your beard. It may be easiest to define the edges of your beard or mustache with an electric beard trimmer. Most importantly, keep the skin around your beard smoothly shaven to make your beard stand out. For more tips on how to get the best shave possible, visit your barber. You can get a professional straight blade shave, ask about your problem areas and pick up some quality products to help you achieve a closer shave at home.